And the Organised Shall Have Leeks in Abundance..
Home/Gluts of the week/And the Organised Shall Have Leeks in Abundance..
Those with greater restraint and foresight than I will still have leeks in their allotment. Gorging and under-sowing saw my harvest vanish before Christmas. However, with a little planning, a prayer against allium weevil and a spot of succession planting, the organised allotmenteer can harvest leeks from August to May. And in the depths, as we are, of the Hungry Gap, the humble leek becomes something of a saviour. I’m a sucker for raw fish and meat. Deliriously tasty. Easy. Impressive for dinner parties. Baby leeks are good here, but larger ones, sliced thinly will work fine too. Wash the baby leeks and trim the ends as delicately as you can. Warm the olive oil in a saucepan and add the leeks. Leave to mingle over a low heat for around 10 minutes or until the leeks are tender. Remove the leeks and keep the oil for the dressing. To make the dressing, mix the leeky oil with a dash of vinegar, mustard and season. Give it a taste and adjust as you see fit. You want a little zing to it, but not so much as to overpower the sweetness of the fish and leeks. 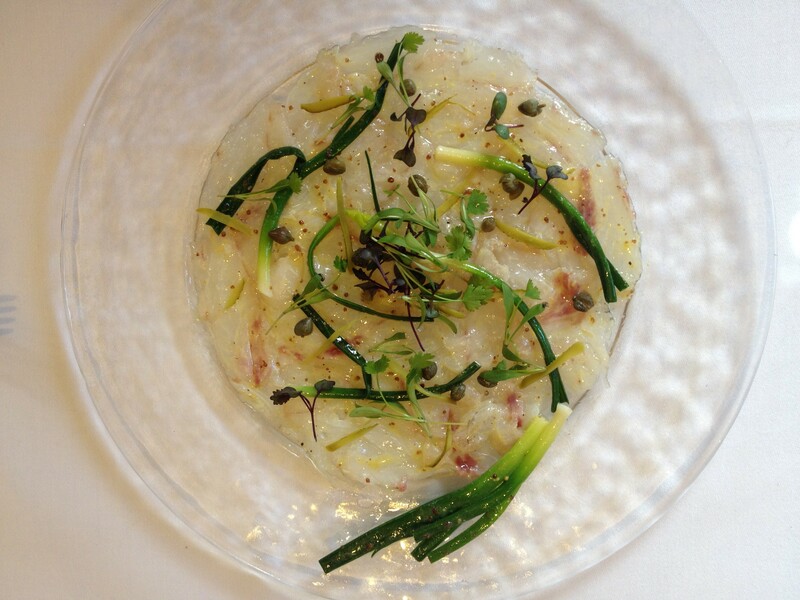 To plate up, slice the fish into gossamer thin slices. The key to this is a very long, sharp, thin knife and confident strokes. Arrange the fish in one layer on the plate and brush on the dressing. Scatter the leeks on top together with the capers, cornichon and a few baby leaves if you’re feeling chefy. From the swanky to the positively down at heel: cheese on toast. This humble supper gets a bad rap, but the addition of leeks lifts it from a student staple to the ultimate comfort supper. In the g&g household, Cheesy Leeks has become the primary remedy for all ailments of both mind and body. Serves 2 souls in need of succour. Chop the leeks and sweat in a knob of butter of a medium heat. Don’t brown the leeks, just let them soften. Add the cream and bring it to the boil. Remove from the heat, stir in the cheese, season and spread generously on your bread. Grill for around 5 minutes until golden and melted. Eat. Feel better. Blue cheese and leeks were born to be together: crumbled blue cheese a-top chargrilled leeks; leek and blue cheese quiche; leeks stuffed with blue cheese (should you come over all Margot Leadbetter)… Heaven. Match. Made. 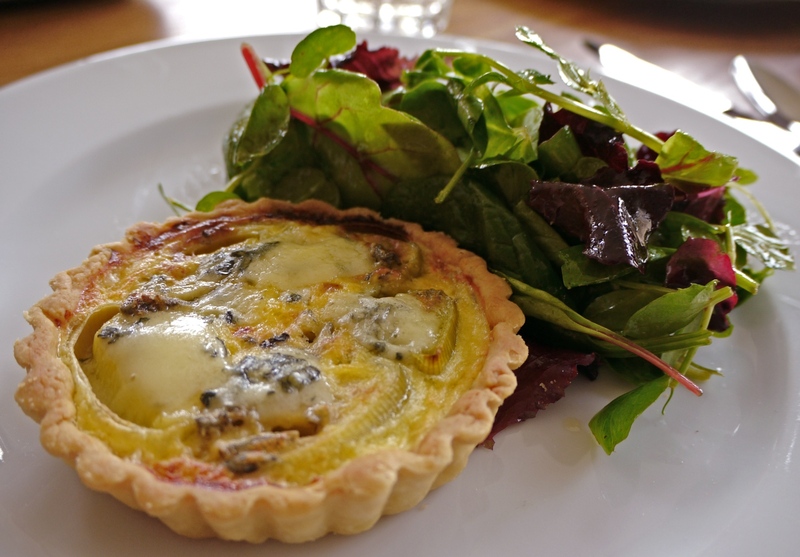 River Cottage resident dreamboat, Gill Mellor, came up with this tart. You can see the full recipe here. It’s a corker, naturally. I think we have 3 leeks left in the garden… just need to decide whether it’s going to be cheesy leeks on toast or the leek and blue cheese tart! I have some leeks, cheese and cream. Just need to find some manly bread now! We’re down to our last bed of leeks (more by luck than judgement) – they truly are a saviour in the hungry gap. I have a few chunky leeks left that would suit the manly bread. And a few puny ones that I could easily pretend are spring onions. Similarly hoping for better things this year – depending on how I fare would love to try all of these. Thanks for these. We’re down to the last row of leeks now, so they need using before they start flowering. I’ve made some leek tarts before, but I’ve not tried the cheesy leeks on toast. I’ll definitely be trying that out this coming weekend, sounds right up my street.